Do you have a family member that doesn’t care for shrimp and another that loves it? Or one that doesn’t care for chicken and another that loves chicken? Well this is the perfect dinner to satisfy the love for both! 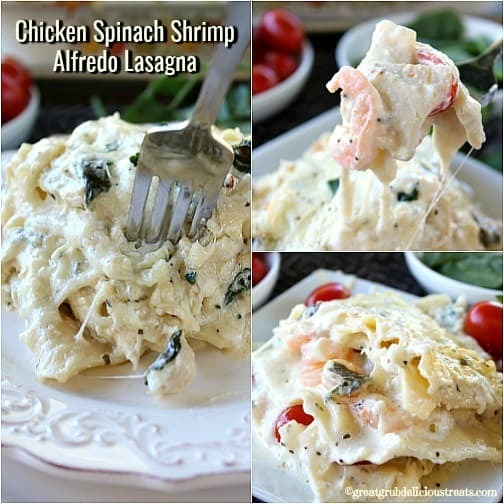 Chicken Spinach Shrimp Alfredo Lasagna will satisfy the whole family. 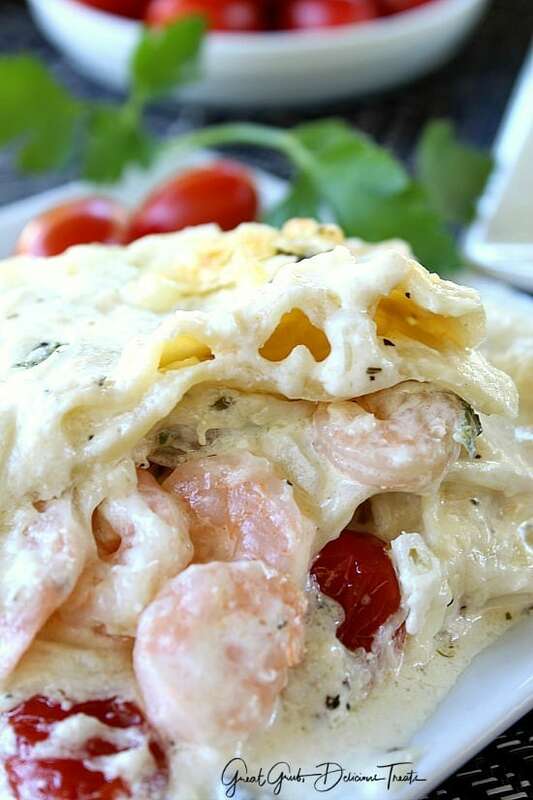 Half of this lasagna is made with chicken and the other half made with shrimp. 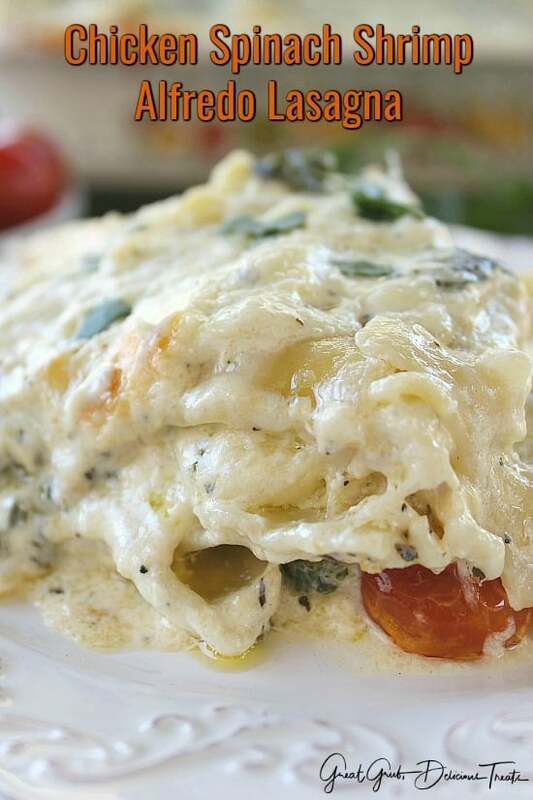 Two great flavors in one delicious meal will definitely have the family lovin’ this lasagna. When I was at work on Friday, I went to talk to my boss about the admits that I’d be doing that day and we started talking food. Corrie (my boss) told me about when she had made an Alfredo lasagna with both chicken and shrimp. As she explained how she made it, my brain was in heaven thinking about making this! It sounded amazing! All day, and believe me it was ONE LONG day, I was super excited about making this lasagna over the weekend. Just to let you know how long of a day it was, I worked until 1:38 am. I had 3 admits, which is a lot for one day and then worked the next day to finish them up. But, it was Friday and that is just what happens on Fridays! Being an Hospice Admission RN is a lot of work but I love it. Corrie told me that she used the larger shrimp but I decided to make it easier and just had my man grab the small, frozen, fully cooked shrimp when he went to the store which worked out fine. 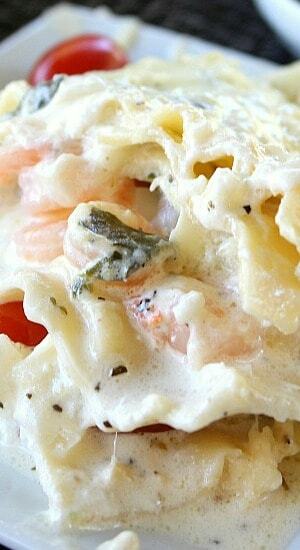 So as I made this amazing Alfredo sauce, I was super excited and could only imagine how delicious this was going to be. It smelt so good. Let me tell you how good this sauce is! It is AMAZING!!! 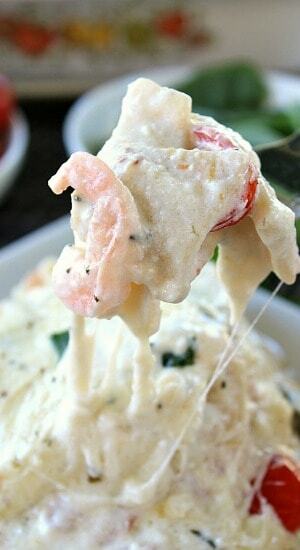 I don’t have a go to Alfredo sauce but as I searched some fellow blogger’s recipes, I ran across The Recipe Critic’s, The Best Homemade Alfredo Sauce Ever. So I decided I would adapt my recipe from hers. Have you checked out her blog? I’m sure you have but if you haven’t, you NEED to get over to her website and check out all of her delicious recipes. They all sound SO delicious! So what I did differently was basically double the recipe and added some additional ingredients. I added onions, more garlic, oregano, basil and I also added fresh spinach to the sauce. Did I say amazing? Oh my, so good! So happy I found her recipe. Make sure to head on over to her blog, you’ll be so happy you did. In the meantime, my chicken breasts were boiling on the stove, I was cutting the tomatoes in half lengthwise and grating the cheese. Oooh, and the best part, besides eating this delicious meal, was putting it all together. 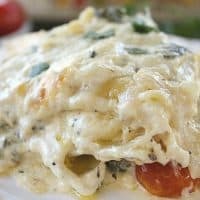 I have been making lasagna forever and my Classic Lasagna has been a hit with everyone that has tried it and has been my go to lasagna recipe for 30+ years. But… and I have to say but, this recipe is super good and now I have another go to recipe for lasagna. I personally liked the chicken better and Corrie said she liked the shrimp better. 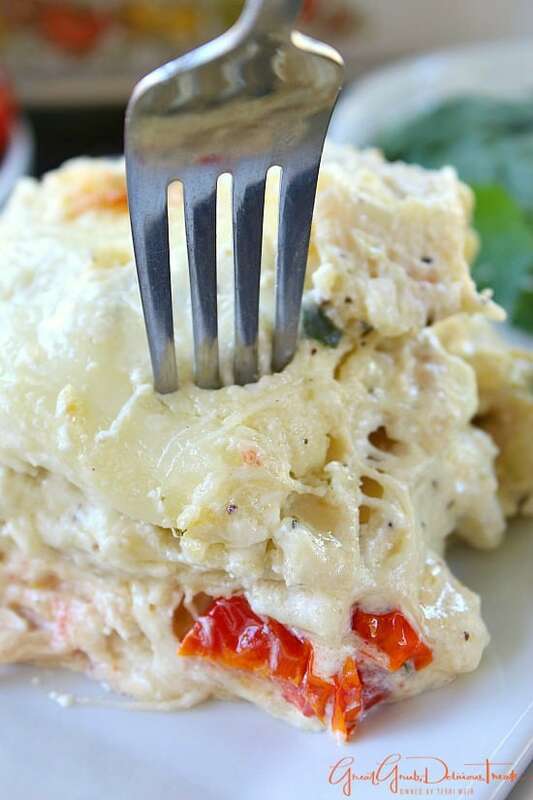 What a great idea of having both chicken and shrimp in one lasagna! Thanks Corrie for the delicious recipe! We LOVED it! In a large sauce pan over low heat, add butter, cream cheese and chopped onions. Stir and when almost melted, add heavy whipping cream, stir. Next add garlic, oregano, basil, salt and pepper. Whisk and cook on low until melted. 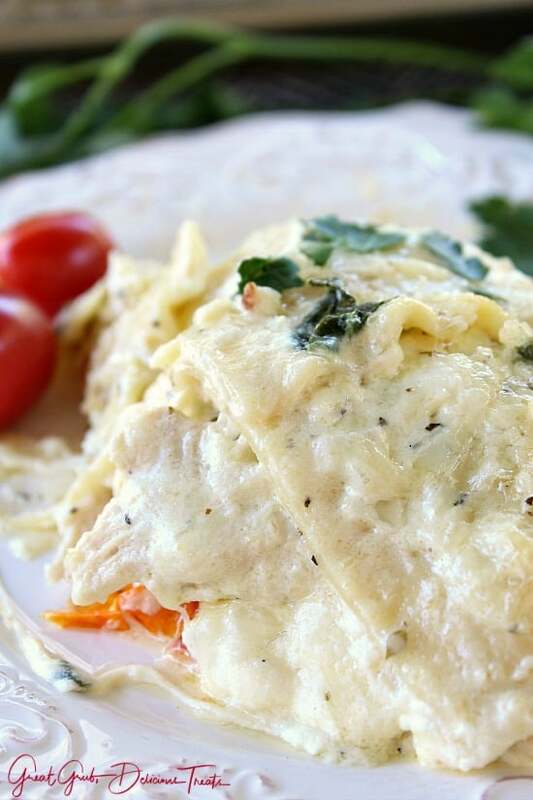 Sprinkle in Parmesan cheese and cook until it thickens up a bit, stirring often (approximately 15 minutes). Add spinach leaves and stir. Put chicken breasts into a pan, cover with water and boil until done, then drain, shred and set aside. Defrost frozen shrimp under cold water for 5 minutes in a strainer. Cook lasagna noodles to al dente. While sauce is cooking, cut grape tomatoes in half, set aside. In a large baking/casserole dish (seriously a roasting pan is more the size you'll need), lightly spray with a non stick spray and add a few large spoonfuls of sauce to bottom of the dish. Put 5-6 lasagna noodles over sauce. Spoon 1/3 of the ricotta cheese on top of noodles and spread evenly. Place half the shrimp on one half of the noodles and half of the chicken on the other side (so one side is shrimp, the other side is chicken). Add sliced tomatoes on top of both the shrimp and chicken. Pour 1/3 of the sauce over shrimp and chicken. Sprinkle with 1/3 of the mozzarella cheese. 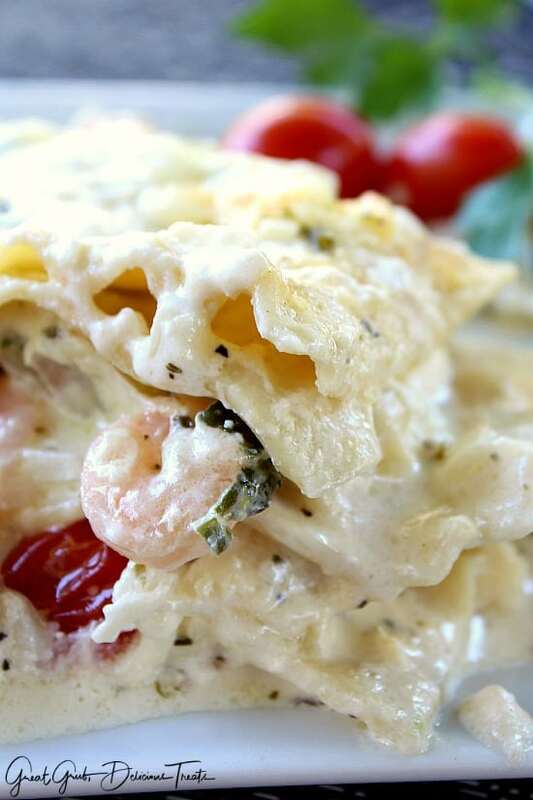 Add another 5-6 lasagna noodles, ricotta cheese, remaining shrimp and chicken. Pour another 1/3 sauce, add 1/3 of the mozzarella cheese. Add the remaining noodles and on top of the third layer of noodles, add remaining ricotta cheese, sauce and top with remaining mozzarella cheese. Spray large piece of foil with a non stick spray and cover lasagna (a tip I learned off The Recipe Critic's post, which I NEVER thought about doing before. What a great idea to keep the cheese from sticking). Place baking dish on a large cookie sheet to catch any liquid spills. Cook for 60-70 minutes, then remove foil and cook for an additional 10 minutes or so to brown the cheese a bit. Remove from oven, let rest for a few before serving. Recipe mostly from my boss Corrie.